The Velleman K8094 is billed as an "Extended Record/Playback Module". As such, it has a socket and support circuitry for an ISD17xxxPY "Chipcorder", in effect about 75% of what is needed to build a serviceable looper for practice, studio or stage use. I started with what the module offered and designed around it a simple buffer/mixer that provides connections for my guitar and amp. Because this project involves a fair amount of hacking, I don't recommend it for a beginner. Accordingly, I'm not describing the construction in nearly as much detail as some of my "breadboard-to-box" designs. If you tackle this one, you must have enough experience to be able to work from my outline and notes. Referring to the Velleman schematic, the ISD17xxxPY chip series will store up to 480 seconds of audio. Exactly how much depends on the chip and the A-to-D sampling rate set by on-board trimpot RV1. The higher the sampling rate, the better the sound quality but the shorter the record time. The kit includes an ISD17240PY, which will handle 240 seconds at an 8 KHz sampling rate--adequate for music IME. Any chip in the series can be substituted with no change to the board. Audio input can come either from an electret microphone cartridge (included with the kit) or through the Line Level input to pin 9. With pin 22 grounded (header connection provided on the board), the chip records from the Line Level input. 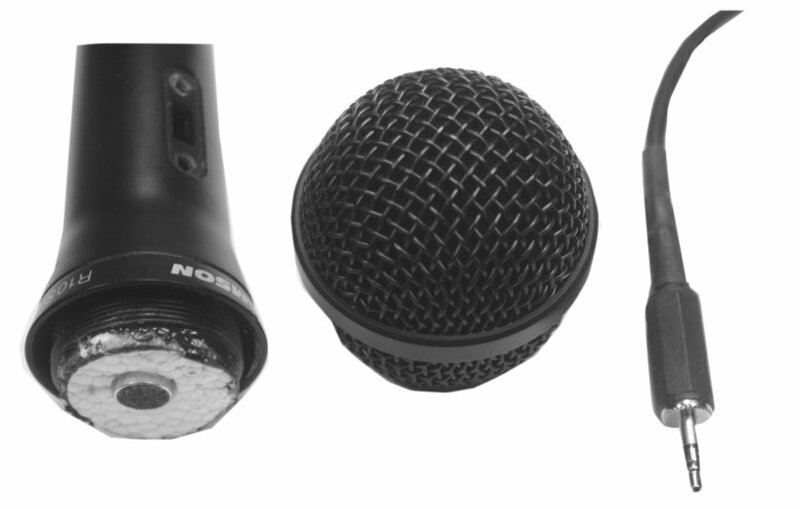 With pin 22 floating, recording is from the balanced microphone input. 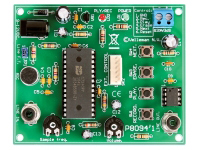 Though I did not use it, the board provides an LM386N amplifier for driving a small speaker. It also has connections for Power and Record/Play LEDs and its own voltage regulator and filter; an ordinary 9- or 12-volt DC wall wart is fine for power. The record, play and erase functions are activated by simple contact closures. Mounting pads are available for the on-board tactile switches provided in the kit. But the same connections are also brought out to an on-board header, and the kit includes a cable assembly that I found convenient for connecting to stomp switches. Q1 is a JFET (can be any common type) set up as a source-follower--no gain, but it presents a high input impedance for your instrument, keeps it from being loaded and isolates it from the stages following. The output of Q1 drives two amplifiers. Record buffer IC1-a couples the guitar signal to the Line Level input on the main board, and potentiometer R5 allows adjusting the level of what is recorded. Potentiometer R2 serves as the Source load for Q1 and also provides a separate, adjustable-level signal to the playback amplifier IC1-b. In playback mode, this is what allows you to play along with whatever audio is coming from Line Out. The enclosure shown is a 1590DD. The electronic design lends itself to building and testing one section at a time, especially if you connect with Molex headers and plugs as I did. Where the pre-terminated 3 1/2" wire that I stock was not long enough, I added wire of the same color and covered with heat-shrink. It adds some cost, but the convenience is completely worth it, IMO. I started by stuffing the main board according to Velleman's instructions and making sure that that much worked with the provided electret mic cartridge. I actually built the whole PCB with the integral speaker amplifier, but I wound up removing those parts later when I figured out that they would not be needed. I suggest leaving out the LM386N and associated parts. In place of the on-board DC power jack provided, I used a standard panel-mount type with external nut. Again, a matter of convenience because I was designing some as I built. At least temporarily, you would also want to connect the power and record/play LEDs. 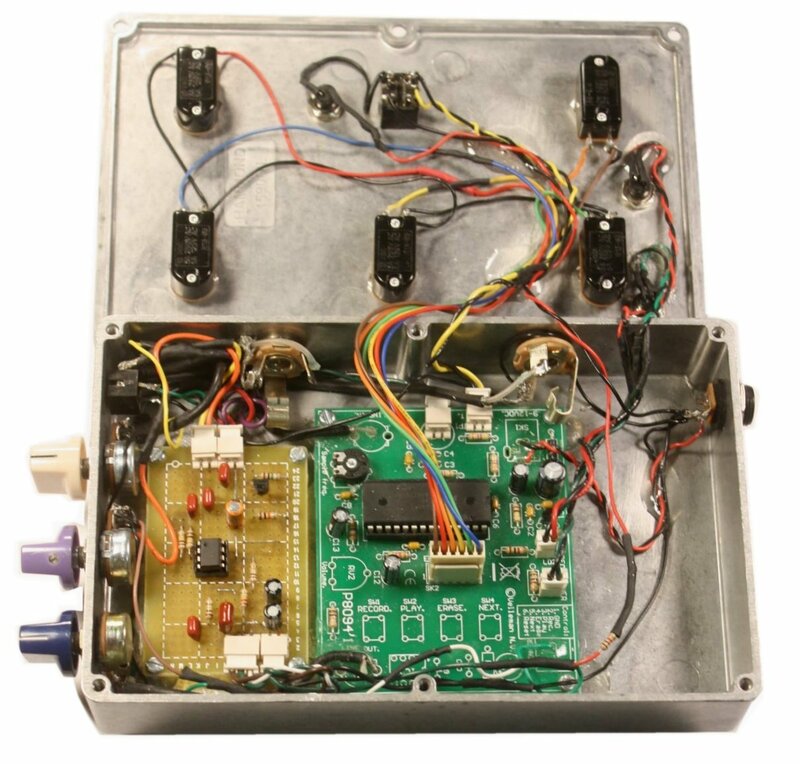 With the PCB stuffed, for test purposes, wire a 100K audio taper pot from Line Out to ground as a level control and connect this output to your amplifier temporarily. Turn up the level control and your amp volume just a little and try the controls for Record, Play and Erase. You don't even need to connect switches yet; use that nice plug that you are given and connect an alligator lead to the ground lead pin 1 (brown). Touching this to the other control leads will work fine. If you get action, proceed. If not, first figure out where you made a mistake with the PCB. Call me crazy; I was determined to make use of that electret cartridge and turn it into something that I could put on a stand. So I bought the cheapest dynamic mike I could find, removed the element and cobbled the cartridge into it. A piece of styrofoam holds it in place. This kind of device is meant to feed a balanced input, not seeing ground, so I wired to it the tip and ring of a pre-fabbed stereo cable. This mates to a panel-mount stereo jack, and the T and R then feed the mic + and - on the board. At this point, I located and glued down studs for the main PCB. If you use the same enclosure, refer to the pic above for positioning. With the board mounts solidly in place, I planned out the connnections that I would need to controls, LEDs, jacks and the mixer board. As I noted earlier, I used Molex headers where it was convenient to do so. To get to the +9 and + 5 rails, I bored out the holes on the PCB that were intended for a speaker connector and ran #24 stranded wire through. I used shielded cable for the connections to Line In and Line Out, but this may not be absolutely necessary...YMMV. With the PCB screwed down temporarily, I located the holes for the output jack to the amp, dc power jack and mike input, drilled those and mounted the hardware. Now I was able to power up, record from the mike and play back before going further. Then I located studs for the mixer board and glued those down. With the blank board in place as a guide to positioning, I tooled the cover plate for the stomp switches and LED holders. Here is a layout for the mixer board. I chose to build and test one stage at a time, starting with the playback amplifier. I laid down and made connections for the power supply busses and ground and wired IC1-b. Then I tested that much with the mike. Next, I located and drilled the hole for the guitar input jack, wired the buffer and made sure that I could get dry signal through the amplifier. The record amp came last. I have been having a lot of fun with my looper, and I am sure that you'll enjoy building and using your own. Comments and suggestions are welcome at smallbearelec@ix.netcom.com.